No coaching staff got more out of less last year than that Texans. But with Arian Foster out and still no clear answer at quarterback, is a great scheme plus J.J. Watt enough to earn a Wild-Card spot? Last season, the Houston Texans were the best-coached team in professional football. This never stood out because they never got hot at any point. But in the aggregate, comparing their roster and injury reports to the game-by-game film study notes on them, it was apparent this was a team that should have at some point gone cold. They never did, though. Under first-year head coach Bill O’Brien, the Texans finished 9-7, just one year after going a league-worst 2-14. This despite O’Brien giving meaningful snaps to four different quarterbacks, the most experienced of the bunch being hit-and-miss journeyman Ryan Fitzpatrick. And it’s not like there were dynamic receivers aiding this quarterback-less passing attack. Andre Johnson had lost a step. DeAndre Hopkins, while impressive in his second season, did not—and does not—quite have the explosive second gear that petrifies a defense. He was still highly productive, though, particularly downfield. O’Brien did a fantastic job constructing route combinations for him, stressing both single-high safety coverages and quarters coverages (safeties around the deep part of each seam). • BILL O’BRIEN’S HARD KNOCKS LIFE: In his 10 Things I Think I Think column, Robert Klemko on why Bill O’Brien is perfect for the HBO documentary series. O’Brien also installed a lot of unbalanced formations that helped dictate coverages, simplifying the game for the offense and creating natural leverage and angles. One of Houston’s staples: a twin tight end closed formation. That’s where two tight ends line up shoulder-to-shoulder outside of an offensive tackle, with both receivers split to the other side. From this formation—and others—the Texans did a lot of damage, much of it from the simple rules of geometry. This formation also set up a lot of the running game, which O’Brien smartly prioritized. Houston’s 30.3 pass attempts per outing was third lowest in the league. Their 34.4 rushing attempts per game were the most in the league. In both realms, they were aided by O’Brien’s selective use of the hurry-up—a tactic he thrived with as New England’s offensive coordinator in 2011. This is the best approach you can ask of a team that is weak at quarterback but has a star tailback like Arian Foster. O’Brien was also wise to maintain many of the zone-blocking concepts that the 28-year-old Foster has grown accustom to running behind—and that his O-line, constructed under zone aficionado Gary Kubiak, has become deftly synchronized in executing. The only time there was a firm commitment to man-blocking “attitude” runs was when the Texans were protecting a lead late in the fourth quarter. Here, they often rode Alfred Blue, who performed well. Much of Houston’s offense, including the ground game, also took place out of shotgun, a more modern, flexible approach given the nature of today’s NFL. This fit Foster’s gliding, patient style. (Think of Foster as a more powerful Matt Forte.) When Foster was out with hamstring problems, O’Brien went with more man-blocking again, tailoring the running game to Blue. With Foster’s groin injury keeping him out the first few months this season, O’Brien now has a difficult decision: alter the running game schematically (i.e. more man-blocking concepts) or try to survive with a low-level backup zone runner? It’s a nightmarish question given that this team has questions at quarterback. Last season, O’Brien also tailored the passing game to Ryan Mallett when he made his first career start in Week 11. Under Mallett—who only lasted eight quarters before being shelved for the year with a torn pectoral muscle—there was more three-step timing and quickly defined throws. If newcomer Brian Hoyer earns the job, that would be more incentive to stick with the zone ground game. Hoyer is much more effective off play-action where the pocket often moves. Everything we’re talking about here illustrates an offense that found ways to control the action. That’s not easy to do when, again, you play four different quarterbacks, and the main one is Fitzpatrick. It is easy to control the action defensively when you have J.J. Watt, however. The gap between Watt and the second best D-lineman in the league is as big as the gap between any two top players at any single position. The 26-year-old has a chance to be a First Team All-Timer. But it’s not like O’Brien’s defensive coordinator, the well-traveled Romeo Crennel, simply lined ’em up and hoped that Watt would take over. Crennel shrewdly aligned the superstar in a variety of formations throughout the season, playing Watt regularly at not just his usual five- and four-technique positions, but also as a wide defensive end and on both sides of the formation. This was a bit of a changeup from what the previous staff had done, and it gave offenses fits. Watt also displayed versatility after the snap. The Texans did a lot with stunts and twists, including off of blitzes. So already having the league’s most difficult player to block individually, Crennel schemed a defensive line that became one of the league’s most difficult to block tactically. Another thing he did was use double-A-gap blitz concepts, both pre-snap and post-snap. This is the NFL’s trendiest pressure tactic; by aligning would-be blitzers in each of the A gaps (i.e. between the guards and center) you stress an offense through the most immediate path to the quarterback, challenge the least athletic blockers (guards and centers), set up a litany of different disguises and zone blitzes and, in the very least, command one-on-one blocking for everyone else up front. (Including Watt.) If an offense wants to hinder this, they have to leave extra bodies in to block, which decreases the number of eligible receivers. That leads to the quarterback holding the ball, which is often perilous against the league’s best defensive lineman. It can be very difficult to play this way when you’re light in the secondary, which the Texans were, particularly down the stretch. At points late in the year, injuries and a general lack of depth at cornerback left this defense relying on the likes of Andre Hal (slow), Darryl Morris (unrefined), A.J. Bouye (inconsistent) and Jumal Rolle (inexperienced). This for a secondary that wants to be complex, often operating out of split-safety coverages that carry highly specific zone matchup principles. So now you know Houston’s schematic templates. The question is: Can they build on their quiet, surprising success of 2014? It will be easier on defense. That secondary was revamped with the first-round selection of cornerback Kevin Johnson. Incumbents Kareem Jackson (surprisingly decent in the slot last year) and Johnathan Joseph (still tremendous at breaking on passing lanes and at stymying deep balls) were re-signed, setting the nickel rotation for at least the next four years. Changes were made at safety; the unsteady D.J. Swearinger is out; either Eddie Pleasant or, more likely, playmaking ex-Giant Stevie Brown, will take over. Either way, fewer mistakes will stem from this position. At free safety, Kendrick Lewis is now in Baltimore. His awareness in Quarters coverage—one of this D’s staples—will be missed, but ex-Bronco Rahim Moore can be an adequate replacement. • VINTAGE VINCE WILFORK: In her 10 Things I Think I Think column, Jenny Vrentas reflects on Wilfork’s performance in a Houston-Washington joint practice. He sure didn’t look done. Up front, Watt is good to go and now stationed next to veteran pickup Vince Wilfork, who still has light feet for a man the size of a small house. Talk about formidability against the run. At linebacker, Brian Cushing is healthier (let’s hope) after making it through to the end of last season following two years of different leg injuries. On the outside, Jadeveon Clowney is also healthy and will be paired in plenty of tandem concepts with Watt. Opposite Clowney, another former first-rounder, Whitney Mercilus, is coming off a second half of the season in which he finally showed a regular kick and pass-rushing creativity. Offensively, things are pretty much the same, only this time O’Brien’s caretaker quarterback is likely to be Hoyer. Expect O’Brien to use the former Brown on rollouts and bootlegs. Before stumbling down the stretch last season, Hoyer thrived in this capacity. On-the-move quarterbacking naturally fits the zone scheme that Houston already has in place. It reasons that this team should be a tick or two better than it was a year ago. A tick or two better for a 9-7 club playing in a still-weakened AFC South means a possible Wild-Card berth. Of course, pro football rarely follows this sort of steady, logical trajectory. At some point, something will go wrong. But at least the Texans will have the right coaches leading them when it does. • MORE AFC SOUTH DEEP DIVES: THE MARIOTA PROJECT BEGINS: The track record of run-oriented college quarterbacks in the NFL is not good. Beginning this summer, the Titans will try to build Marcus Mariota into a passer who can buck that trend. | PRESSURE BUILDS IN JACKSONVILLE: Two years after an organizational overhaul, the Jags should be on the road back to respectability. But do GM Dave Caldwell and coach Gus Bradley have the right pieces in place? 1. 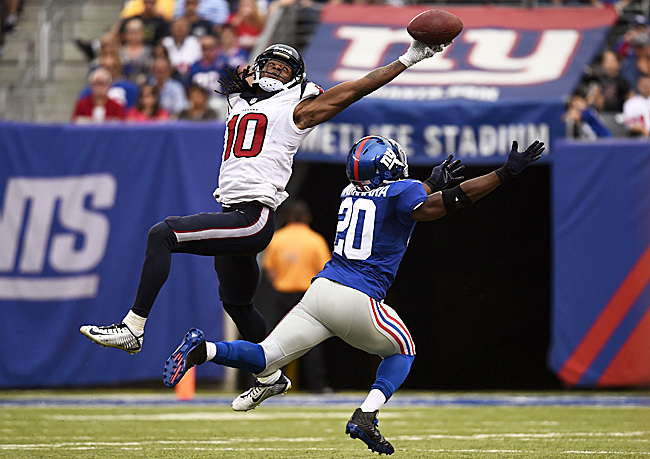 It will be fascinating to see what the Texans get from DeAndre Hopkins. He’s coming off a 1,210-yard campaign after posting 802 yards as a rookie. With the rest of the receiving corps filled out by Cecil Shorts, Nate Washington and third-round rookie Jaelen Strong (who, based on O’Brien’s history and the complexity of his scheme, will likely capture nothing higher than Damaris Johnson’s No. 4 job early on), Hopkins will attract the main attention from opposing defenses week in and week out. As mentioned above, he’s not a dynamic second-gear runner. But he was still very fruitful on deep passes last season, with playmaking ability due to the ability to snag tough balls away from his body. He could have anywhere from 800 to 1,500 yards receiving this year. 2. This offense needs more from receiving tight end C.J. Fiedorowicz. The 2014 third-round pick never carved out a niche as a rookie. Presumably, O’Brien wants to play with two tight ends as much as possible (all the better for flexibility and tempo). Fiedorowicz must show more for that to happen. 3. Center Chris Myers will be missed. Now 33, it’s become increasingly difficult for the 290-pounder to win power battles in a phone booth. But Myers still showed the necessary quickness to reach-and-seal defensive linemen on stretch blocks last season, and his awareness in the zone scheme ensured stability in the middle front line. Replacing Myers is Ben Jones, who was fine as a starting guard a year ago. The question now is whether Jones’s replacement, 2014 second-round pick Xavier Su’a-Filo, is ready for a fulltime role. He saw minimal action as a rookie. The Texans are counting on Su’a-Filo; unlike previous years, they don’t have encouraging depth up front. 4. Left tackle Duane Brown must be sturdier in pass protection. Brown is great when he’s the aggressor. But by Pro Bowl standards (he’s been to three), he can be inconsistent as a reactor. 5. Simply staying healthy won’t be enough for Clowney to fulfill his considerable potential. He must become more bendable. Clowney has great suddenness off the snap, but if he can only go north and south with it he’ll be a five-sack a year hybrid pass rusher reliant on the scheme to help get him in the backfield. He must learn to dip and turn while on the move.